To carry my tobacco ‘round. And the little ones through the cracks. She couldn’t shut her mouth. I didn’t want ’em all! Would cover an acre of ground. 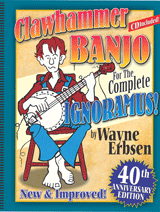 Instruction on how to play this song can be found in Wayne Erbsen’s book: Clawhammer Banjo for the Complete Ignoramus.